Here is an article I wrote a few years ago and had published in the close protection magazine “The Circuit”. This is the version with the photos! January 2013 and I am sitting in the back of a Toyota Prada on the outskirts of ill-famed Cité Soleil in Port-au-Prince, Haiti, which is regarded as one of the poorest and most dangerous slums in the Western Hemisphere. My Haitian operatives are doing a deal with a local senior gang member; a chubby kid in his early 20’s wearing an Ed Hardy T-shirt and big, white sunglasses, who was sitting outside of a dirt floored plywood shack, mingling with several other local young ladies and gentlemen… We needed to go into Cité Soleil to perform an advance reconnaissance on a location our VIP client would be visiting the next day; not a recommended area for a day trip but since they were paying the bills it was their choice. The deal was done and for a few dollars we had a local kid ride with us, acting as our guide and ticket of good faith. During my long career I have been in such situations numerous times and the threat of being set-up, ambushed etc. is always present but that goes with the turf. I am sure it was clear to the teenage gangbanger who was sitting next to me that if things went bad he would be the first to be gut shot; if I was going to suffer, so was he! I am fairly certain I was the only white guy for a few miles around and the odds of me making it out would have been slim… such is life, I chose to be there. Having served in Northern Ireland with the British Army in the late 80’s and early 90’s the murders of Corporals Howes and Wood in Belfast, 1988 emphasized how vulnerable a vehicle is when trapped by a violent mob and how your reaction must be fast and aggressive. Corporals Howes and Wood wrongly drove into an Irish Republican Terrorist’s funeral procession and were attacked by the mob, dragged from their vehicle, beaten, driven to waste ground, stripped and executed with their own weapons. Click here for video of the incident. After about half an hour later it became clear that the location we were looking for was not in Cité Soleil. After numerous phone calls it was confirmed the site was a few miles outside the slum in greener pastures. This is a perfect illustration for the necessity of advance security procedures. This client set himself apart from many others by spending a few extra dollars and getting things done in advance, properly thus avoiding any potential issues. Over the 24 year span of my career I have seen little need for evasive driver training but have seen the need for people to learn how to handle vehicles at high speed and in hazardous weather conditions. The main thing you need to learn is how to drive safely, be able to identify any possible threats and how to avoid them. In most large towns and cities you will not be able to perform such things as J turns or other evasive maneuvers due to lack of space and heavy traffic, so you must always be aware of what is going on around you. My primary advice to people is to keep as much space as possible between themselves and the car in front, as this can give you some space to maneuver in congested traffic. When you are driving look around and always be thinking of where you could take evasive action; in urban areas there will be few places where you could spin your car 180 degrees and drive against the traffic flow; that’s Hollywood, not reality! If the criminals or terrorists are in anyway professional, they will attack you when your car is penned in and you cannot perform any evasive maneuvers, not on wide open roads. It’s common street kid tactics in a lot of Latin American cities to rob cars at traffic lights that are at least two cars back from the stop light with other cars behind them; these cars are stuck and cannot escape. If street kids on bicycles with rusty revolvers have worked out how to jack people in cars, don’t you think their big brothers have also? One such story came out of Latin America; a top competition shooter was driving to work one day when two kids on a motorcycle pulled up next to him while he was stuck in traffic. The kid on the back of the bike had a revolver and asked the competition shooter at gun point for his wallet; he complied. As he was handing over the wallet he reached for the Walther PPK on his ankle. The kid saw the gun, shot and killed him. Who was the better shot that day, the trained or the street wise? The wounded driver crashed the truck a short distance from the scene of the incident. Another important thing to consider when working with vehicles is the type of ammo you carry in your pistols; if you have the choice full metal jacket rounds could be a better option versus hollow points as they penetrate better through windscreens windshields and doors etc. A good example of HP rounds not penetrating enough happened to a close friend and associate of mine in 2010 when he was robbed and car jacked by two wanted armed criminals on the Caribbean island where he lives. He did a good job and managed to deploy his 9mm Sig-Pro that the criminals failed to find when they frisked him. The shooting started when the attackers tried to make their getaway in his truck. The end result was that one of them died and the other survived even though critically wounded. The reason one survived was because he was shielded from the police recommended 124 grain hollow point rounds my associate was shooting by the frame of the car and the seats. The rounds went through the frame and hit him several times in the head, but without enough power to penetrate the skull and kill him. I believe that if my associate had mixed in a few full metal jacketed rounds in his magazines there would have been two dead criminals that day. he needed new seat covers!! It always amazes me to still see police and security personnel using out of date Israeli style procedures and not keeping a round chambered in their weapons. Basics, always fully load your weapon and put a round in the chamber. Your reactions have to be fast and aggressive! A typical suburban West African Rd! While I was in Nigeria in 2012 there was one incident where three police officers were killed in what we believe to be an attempted assassination of the VIP they were escorting. While on a busy and congested road the policemen exited their truck and approached a car that was blocking it and their client’s vehicle’s route; as they got close one of the criminals opened up on them with an AK-47 and all three died at the scene. The officers who were all carrying AK’s with the safety catches on and no rounds in the chambers approached in a bunch, did not use cover and they did not stand a chance. The client’s vehicle was hit and one of their children was wounded. Consequently the criminals ran out of ammo and ran into the crowd. Below is a photo from one of the vehicles that was involved in the incident; it was hit once and that was enough to stop it. These days there are so many computers in a vehicle’s engine that if one is damaged the car will just stop running! In a perfect world engines should be armored but the main issues would be the client’s willingness to pay for this, the availability of materials and mechanics to do the job and a lot of times the answer will be “NO”. I am regularly asked by my clients whether I favor armored cars or not. In my opinion, as it is with everything else, they have their pros and cons. Armored cars do have an application and the first thing you need to consider is what level of armoring the vehicle you’re buying or using has. I have come across people driving around in cars armored to stop pistol caliber rounds in areas where the bad guys carry assault weapons. They thought an armored car was all they needed and were unaware of the different levels of armoring. You will also need to confirm where the car is protected; doors, windows, floor, engine, roof etc. Due to the fact that some vehicles may only have some armored panels in the doors and rear seat, it is necessary to always check for yourself and not take anybody’s word for it. West Africa: Congestion can be expected and traffic rules ignored! Now think like the criminals,: if you knew your target was driving around in a SUV armored to B6 level are you going to shoot at them when they are in route or wait for them stop and get out of the vehicle or stop them and make them get out of their vehicle? Think about how can you get someone out of a car; what would you do if a female driver bumped into the back of your car? Would you get out to inspect the damage and thus possibly be kidnapped by her two armed accomplices crouched in the back seat of her car? Always be aware of decoys that are intended to make you stop and get out of your vehicle, such as accidents or even bodies next to the road. Basic rule: stay in your car and keep moving between safe areas. A criminal tactic in Europe when targeting armored cash-in-transit vehicles is to box them in, cover the van in gasoline, then give those inside the option of throwing out the cash, surrendering or being burnt alive. An issue with armored vehicles is that you cannot shoot at the criminals from the inside. There was one incident I recall from the mid 1990’s where an unarmored van that was moving cash was stopped and ambushed in an Eastern European country. The fact that the van was unarmored enabled the security personnel inside to shoot through the side of the van and fight off the attackers, which they could not have done if they had taken and armored van that day. There have also been numerous incidents where criminals have assassinated targets traveling in armored vehicles using Improvised Explosive Devices (IEDs), Rocket Propelled Grenades (RPGs) and improvised shaped charges. 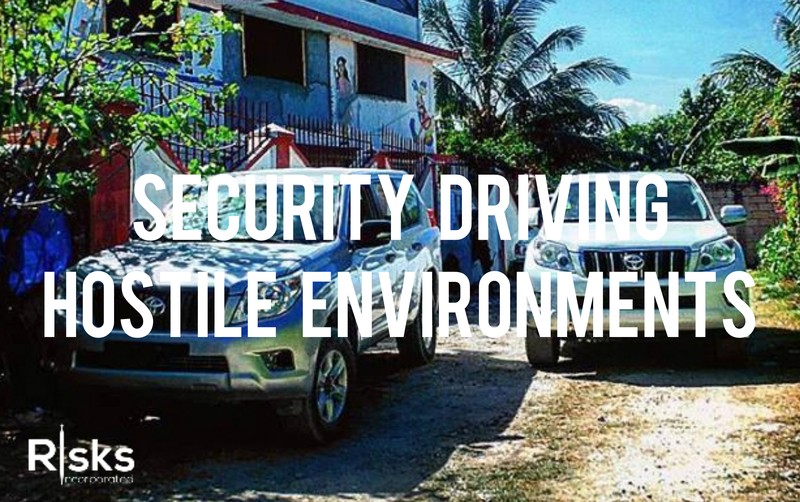 An armored vehicle can assist you in your security program but it should not be all there is to it. Basic advance security and route selection still have to be applied. A barrio on the main airport road in Caracas, not somewhere you want to break down! In January 2013 my business partner in Caracas, Venezuela was attacked while driving his armored Land Cruiser. This is a good example of how sporadic incidents can happen in seconds in places like Caracas and how a professional response can save lives. The criminals in this case were car jackers or express kidnappers who trawl the streets looking for victims. His vehicle was shot fourteen times and if they hit it fourteen times I am sure they missed another fourteen. This also serves as a good example to emphasize that the bad guys have no intention to play with you, they mean business! Luckily no one was hurt in this incident. I expect the fact the vehicle was armored and that he hit the breaks for them to hit him let the attackers know they were not playing with an amateur. Criminals want easy targets, don’t be one! Previous Received the hard copies of my Newsweek Serbia interview!